Catching up, Part 1: Trains, Planes, and – Strike?! There is beauty to be found in a life so full that writing a blog post is the last thing on one’s mind. However, I must also plead forgiveness from all of you who have asked for updates. My external hard drive has decided not to let me access my photos (a trip to Best Buy is in order) and it seems so disappointing to write these posts without showing adequate images of the places, the history, the food…! Now that I have officially returned home as of last evening and am still fighting the effects of jetlag (it is 5AM in Maine), it is FAR past time for me to indulge my overly florid writing style to make a record of and offer a few silly observations regarding all that I have seen and experienced since early May, with photos from quite the variety of sources! I have spent more time in trains and planes during the last two months than I ever though possible, or humane. However, the destinations (Rouen, Houston/Dallas [not quite Europe, but a part of my itinerary nonetheless], Paris, St-Omer, Béthune, Ypres [Belgium], Iceland, and, finally, a treasured last few days in Toulouse) made the day-long trips into precious times to process each unique experience. The months of May and June in France are famous for the strikes, or grèves, especially those of the SNCF (France’s national railway company), air traffic controllers, Air France, and other such travel mediums. To us outsiders, it’s a little bit as though the weather becomes so beautiful that everybody decides that working is passé, and alors, il faut faire la grève. There is a reason why one can actually google “France’s striking culture,” as they have it down to quite a science. There’s even a website called C’est la grève where one can find out if upcoming travels will hindered. All strikes, thankfully, are scheduled and most of those involving the SNCF take place on Thursday and Friday (or Tuesday, or really any day), meaning that services are cancelled, limited (one out of three trains running), or extremely, (extremely!) slow. This is accompanied by protests, marches, and other such means of totally interrupting normal work. When actually looking at the reasons why this past May’s weekly protests were SO prolific and so strong, I suddenly understood why. They were a response to new proposed labor reforms that, briefly summarized, reduce workers’ free weekends by 2/5ths, lower the hours that they have off between shifts, raise the number of nights one can spend away working in sleeper trains from one night to two or even three, remove the right of rail workers to know their schedule several days in advance, and lower the amounts that they were reimbursed if they had a commute to work. This does explain why there were four grèves générales et nationales during the month of May, each of which lasted over 24 hours and stopped the movement of peoples almost entirely. Perhaps one of my most exciting airplane travels took place on the ground: trying to access the Toulouse airport on May 26, when the tram was blocked, taxi drivers were not interested in driving, and all but one entrance to the airport was open (and, of course, nobody publicized which one). Instead of 10 minutes, it took over an hour or driving before we found an access point and I made my flight! One of the worst rail strikes resulted in my having to cancel a trip to St-Avold, a stunning little town in northeastern France, for an organ and clavichord weekend! Katie Minion, another Fulbright organ scholar in Toulouse, and I were to teach on both instruments and perform some little concerts with several other teachers from the area but, due to the SNCF strike causing our trains to be completely cancelled. After searching through all possible options to travel the nearly 1000km (1. fly to Paris – 400€, nope. 2. Blablacar [car sharing service] none available, nope. 3. Take the chances on smaller trains with the potential for 18- to 24-hours of travel, nope. ), all of us involved decided that it would be better if we stayed in Toulouse! I have never before been in the situation where there was quite literally no options to leave a city. Thankfully, the strike had ended (for the moment) by Monday and I was still able to make the unforgettable pilgrimage to Normandy to see the 1890 Cavaillé-Coll in Rouen’s St-Ouen. Perhaps it seems a little odd to travel some 22-hours (round trip) to spend only 21 hours in a city but there was no question that I had to find time to visit during the year. How incredibly fortunate I feel to have been able to. After a quick espresso to recover from the long hours in trains, I was locked into the former Abbey church to explore the unusual sonorities of this monumental historical instrument. Cavaillé-Coll used 20 of the extant stops from an 1803 rebuilding, which would perhaps better be called a re-combining of pipes from three different organs (when an 8′ montre and part of the case remained from the half-dozen previous organ builders), and expanded the instrument to its eventual 64 stops – making it one of France’s largest. Even if one affirms that size isn’t everything and looks merely at the quality, there is no disappointment to be found! Simply because of the size, Cavaillé-Coll was able to explore more unusual stop colors throughout the four manuals. Of course, everybody speaks of the 32′ Bombarde, which awakens even the laziest pigeon sitting along the tribune, but the Spanish chamades, even more powerful than those of St-Sernin, bring out the tenor range in such a way that the end of the first movement of Vierne’s Symphonie II can finally be heard with its true masterful combination of themes. The huge, 20-stop récit sits atop the organ, singing into the room through a swellbox effective enough to even allow a performer to consider presenting English romantic music. Its voix éolienne requires even the organist to sit on the edge of their seat to listen. The Grand orgue‘s harmonic flute, used in Widor’s Andante sostenuto, made the always-challenging left hand phrasings simple. The Abbatiale is word-renowned for its gothic architecture, which inspired Widor’s Symphonie Gothique, one of my projects this year, and this also drew me to visit and explore the soaring arches, stunning stained glass windows, and intricate ribbed vaulting. It was astounding how much light came into the room, even as the evening wore on. However, it’s not for the light that most organists go to such a cavernous space. The acoustic – that one “stop” on the organ about which the organist has no control – was simply astounding. Each sound that the organ made was given shape through an unreal flexibility and I could continue writing for pages and pages about this combination of instrument and space. 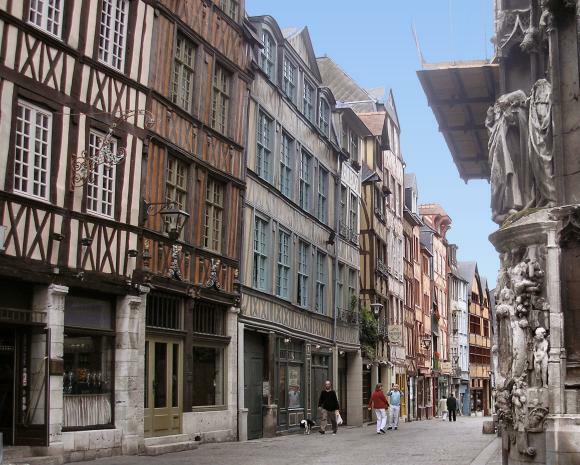 I barely had a moment to see the city of Rouen, but managed to explore on foot the following day – a Monday, when nearly everything was closed! This didn’t stop me from wandering through Vieux Rouen, seeing the Gros-Horloge (an incredible 14th-century astronomical clock that one simply stumbles upon when turning a corner), and visiting the Place du Vieux-Marché. Since the museum was closed and I didn’t make it to countless other historical places, it seems I will have to come back, this time for a few more hours!